How many times did Bing Crosby record 'White Christmas'? Title: How many times did Bing Crosby record 'White Christmas'? The first song on the video was Bing Crosby's "White Christmas," and for some reason it didn't sound quite the same to me as it has for the last 70 or so years. I can't say exactly what there is about it that sounds different to me. Maybe it's just my aging brain playing tricks on me, but it just seems to have a subtle different sound to it. Did Bing make more than one recording of "White Christmas"? But I'm wondering how reliable that information is. For example, she wrote that the 1941 "radio premiere of the song on Kraft Music Hall was lost or taped over." But did radio networks even have tape recording equipment in use in 1941? So, I'm turning to an expert, to give this a listen. To your expert ears, does this YouTube version sound like the same one that we've been listening to every since I was a kid in the 40s? Re：How many times did Bing Crosby record 'White Christmas'? What you heard on YouTube is "Take B" of Bing's original 1942 version of "White Christmas," which is the one that Decca released later that same year. In "Take A," there was a minor imperfection at the end of the recording, so Decca had Bing re-record it. Both takes were recorded on Friday, May 29, 1942: Take A was recorded in the morning, and Take B was recorded in the afternoon. The great John Scott Trotter arranged and conducted, and The Ken Darby Singers provided the background vocals. The most famous version of Bing's "White Christmas" came five years later, when, because the original 1942 master had become so worn out, Decca had Bing re-record the song again. This classic and definitive version was recorded on Wednesday, March 19, 1947, and it once again featured John Scott Trotter and His Orchestra and the Ken Darby Singers. 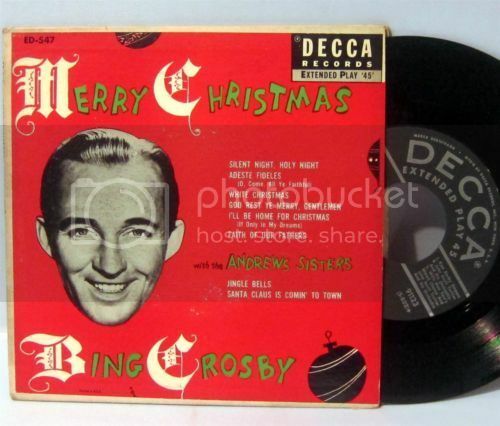 Another Decca studio recording of Bing's "White Christmas" was recorded on Saturday, April 20, 1954. This version was for the "unofficial" Decca Records soundtrack LP release for the Paramount motion picture of the same name, White Christmas. This version, though, did not feature John Scott Trotter nor The Ken Darby Singers; but rather this version was recorded with Joseph J. Lilley and his orchestra and chorus. As for the Kraft Music Hall radio performance that you alluded to in your post, it was just that, a radio performance, not an official studio recording. Another recording, though again not an official studio recording, was a version that Bing did for Frank Sinatra's 1957 TV Christmas special called Happy Holidays with Bing and Frank. This now classic Christmas special aired on Friday, December 20, 1957. Aha! So my addled old brain wasn't playing tricks on me after all, eh? Thanks for that summary of the recording history of Bing Crosby's "White Christmas," Chip. I figured that if anyone knew the answer to my question, it would be you. My experience of listening to that 1942 version this morning was sort of dream-like, you know, how in dreams you see and hear things from your waking life, but they are not exactly the same as in your waking life? The version I found on YouTube seems to be missing the intro. Do you know where to find a complete recording of that 1942 version?